Are you in need of commercial baking tools? Look no further...our wide selection of baking and pastry tools at wholesale prices will keep your bakery rolling out the dough. Every pastry shop needs the essential baking tools - rolling pins, dough scrapers, icing spatulas, and pastry bags. We sell items in bulk cases or individual pieces. Vollrath High Temperature Spatula - 16.5 in. Vollrath Plastic Spatula White - 8.38 in. 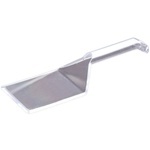 Vollrath Plastic Spatula White - 13.63 in. 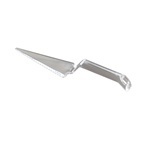 Vollrath Soft Spoon Shaped Spatula - 13.5 in. Vollrath High Temperature Spatula White Red - 13.5 in. 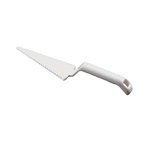 Mundial Dough Cutter White Handle - 6 in. x 3 in. Mundial Spatula Bakers Icing White Handle - 6 in. Russell Dough Cutter - 6 in. x 3 in. Russell Sani Safe Dough Cutter Scraper - 6 in. x 3 in. Russell Bakers Offset Spatula - 10 in. Russell Bakers Offset Spatula - 6 in. Russell Bakers Spatula - 8 in. Update International Aluminum Rolling Pins - 18 in. Update International Stainless Steel Roller Dockers Wide Barrel Handle - 5 in. Update International Wood Rolling Pins - 15 in. Update International Wood Rolling Pins - 18 in. EMI Yoshi Plastic Party Tray White Cake Cutter and Lifter - 10 in. Sani-Safe Dough Cutter and Scraper - 6 in. x 3 in. Anodized Aluminum with Satin Finish Biscuit Cutter - 2.5 in. x 3 in. 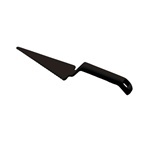 High Heat Plastic Spatula - 10 in. Spoon Shaped White Spatula - 16.5 in. Wooden Rolling Pin - 15 in. Buy wholesale Bakery tools and serving utensils to help make those wonderful desserts and serve them to your guests as well.